Direct replacement StopTech Sport slotted rear brake rotors for the stock 2005-2014 Mustang GT brake system. Most people buy a set of left and right rotors for their Mustang. However, due to accidents or other circumstances, you might occasionally need only a left or right rotor. Choose from the available selections listed above. StopTech Sport rotors were formerly sold under the PowerSlot brand name. Part numbers: 8182PSL and 8182PSR. Direct replacement brake rotors for the Mustang stock brake system. Improves cooling! StopTech rotors feature slotting that sloughs off the hot gases and debris that form between the pad and the disc. This action also adds more bite. Looks great behind custom wheels. Improved appearance. Helps your Mustang's rear brakes match the aesthetics of a StopTech front big brake kit. 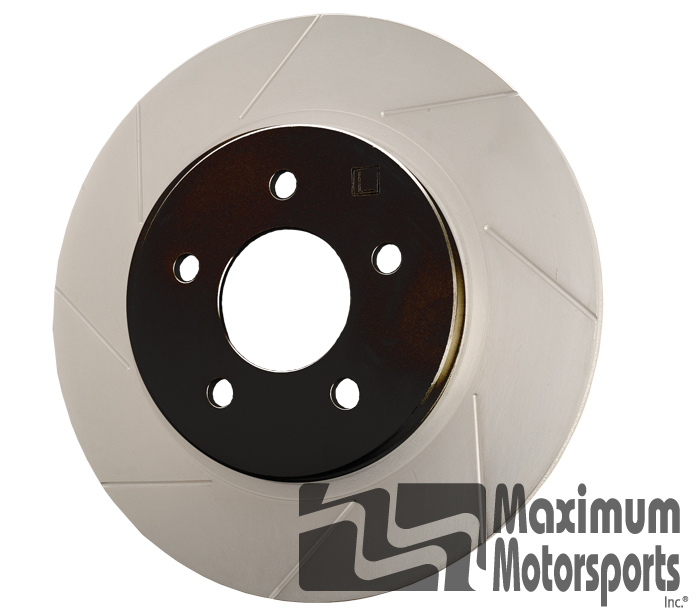 Rotor finish prevents pad glazing and improves wet and dry braking performance. Excellent corrosion protection on non-swept surfaces provided by e-coating. Durable black e-coating on the non-swept areas of the rotor (both sides of the hat, inside the cooling vanes, and on the outside edge). Direct replacement of stock rotors. E-coating is a superior, electrostatically applied finish designed to withstand 400 hours of salt water exposure without rusting. This is especially important on both mounting faces of the hat: where it touches the hub flange and the back face of the wheel. Any accumulation of rust in these areas can lead to installed lateral run-out issues. All items made by another manufacturer are warranted to the extent of that manufacturer's warranty. Non-Maximum Motorsports-manufactured items have no Maximum Motorsports warranty. How do I make a claim for warranty replacement of StopTech 1-piece rotors? Please have the part number ready, and your purchase receipt. We will need to confirm you are the original retail purchaser. If you purchased your item from an authorized MM dealer, please have their invoice number available for us to confirm the purchase. We will first assist you in determining if there actually has been a component failure, or if something else is amiss. If it does appear to be a part failure, at our discretion we may choose to send you a replacement part, or require that you purchase the replacement part subject to later reimbursement upon return to us of the failed part.